For that matter, the MCU movies have been perfectly willing to shrug off plausible human behavior in favor of emotional moments and striking images. Why would S.H.I.E.L.D. house its top-secret medical storage facility, where Captain America is meant to be protected from the modern world after his hibernation, in the middle of Times Square, instead of in some remote country hideaway? The answer—for maximum visual punch when he escapes into a modernist nightmare—doesn’t make any sense in terms of narrative conviction, but it still hits hard in the moment. The logic doesn’t necessarily have to be clear in any moment that evokes strong feelings. And MCU movies, like big action blockbusters in general, are all about the moment of impact. They’re meant to overwhelm viewers’ senses and overload their cortexes with sheer wish-fulfillment excitement, whether it’s the thrill of seeing a few lone heroes take on an alien army, or of trying to keep up with lightning-speed, sexually charged one-upmanship between Tony Stark and Pepper Potts as they fence for advantage with each other. Scientists and civilian fans have a blast after the fact dissecting the reality and plausibility of Iron Man’s chest arc reactor, or trying to explain the specific rules that govern Thor’s hammer Mjölnir. But in the moment, all that matters is a sense that the story is playing fair and the characters themselves are real enough to matter—or fun enough that it doesn’t matter. But in Ant-Man, the latest blockbuster in the MCU lineup, the narrative problems actually get in the way of the story’s progress. That’s probably an artifact of the mid-production writing/directing switch-up, which left the script feeling incomplete and not entirely thought through: The action relies on the usual outsize motivating emotions, like fear, anger, and love, but they’re so awkwardly expressed, or so blatantly unexpressed, that they confuse the action instead of driving it. The science isn’t just hand-waved away as the price of admission, or with an airy, “It’s a mystical artifact, roll with it”—the script bases actual structural story events on blatantly contradictory information. 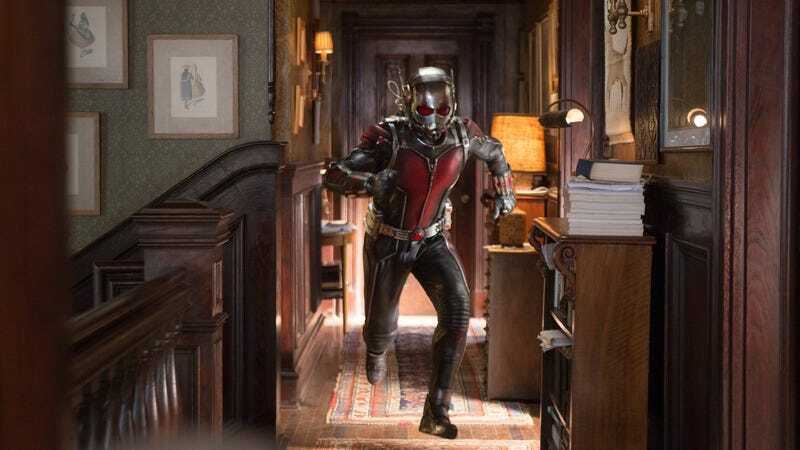 Hank Pym (Michael Douglas) was reportedly watching Scott Lang (Paul Rudd) for a while, long enough to judge his character and superhero aptitude. So maybe he could predict that Scott was desperate enough to see his daughter that he would follow the rumor of a big score far enough to break into Hank’s house and his safe. But how in the world could he predict that Scott would a) steal what looked like a crumpled old Halloween costume, b) choose to put the thing on, and c) activate it? That was all clearly part of Hank’s plan, since he was standing by on communications, waiting for it to happen. But the Pym Particle makes things change size. It doesn’t make people psychic. When Scott first activates the suit, shrinks, and winds up in a Honey, I Shrunk The Kids nightmare, why doesn’t he just press the button on the glove again? It’s literally a half-inch thumb movement. Yes, he’s tumbling through bathwater and a drain and a DJ set and a dance floor, and it’s all very disorienting—but he’s cogent enough to run from every new threat in turn, yet not cogent enough to press a button that’s already on his hand? For that matter, why doesn’t it get accidentally mashed when he’s crashing into everything on the planet? What exactly is the MacGuffin that Scott has to fetch from the new Avengers HQ, leading to the fight with Falcon? Hank says something brief about it—it’s a whatsit-dealie, it fell into Howard Stark’s hands, he needs it back for the raid—but it never seems clear or important as a device in the final run. It leads to a great fight sequence, but the script seems almost comically aggressive about de-emphasizing why the whole sequence happens in the first place. Why doesn’t Hank just build another whatsit-dealie? For that matter, when he still had control of his company, why didn’t he delete his research instead of “burying” it where Darren could find it? He knew it was dangerous and that he didn’t want anyone getting their hands on it, but he had enough control to obscure it, but not to get rid of it, or enlist his former staff to get rid of it? How much did Baskin-Robbins pay for the product placement here, not just in terms of having major scenes set in a Baskin-Robbins outlet, but to get everyone to repeat “Baskin-Robbins” over and over, while treating the company like a total badass? Why doesn’t Hope know what happened to her mother? Hank has been entirely open with his daughter (played by Evangeline Lilly) about his technology, and his concerns about how it might be used. She knows about his history with the suit and his ant-controlling rig—she’s clearly practiced extensively with ant control. So why has he been lying to her all her life about just this one aspect of his past work, especially when she knows he’s lying, and it’s one more thing driving a wedge between them? Why does he think it’s important that she not realize Janet died a hero? (Well, “died”—there’s no body and this is a Marvel story, so she’s guaranteed to show up again eventually, if the series continues long enough and it becomes narratively interesting.) For that matter, since Hope is familiar with and emotionally invested in her father’s work, why hasn’t he enlisted her in the research he’s been doing, trying to find out whether Janet survived? She’s one of the few people who would understand his drive to find out more about the subatomic realm, and would be as invested in it as he is. Why doesn’t Scott even ask about the downsides of the Ant Man suit? When Scott asks why Hank doesn’t just become Ant-Man again, Hank says grimly, “I wore the suit for years. It took a toll on me.” And Scott asks… exactly zero follow-up questions, about what kind of brain damage or explosive impotence he might be risking by using the same suit. Scott knows Hank doesn’t want Hope wearing the suit because it’s unsafe. Isn’t he the slightest bit curious about why it’s unsafe, beyond the superheroics involved? Or about the statements Hank makes about how dangerous the Pym Particle energy is, and how it warps the user’s mind? Doesn’t it ever occur to him that he’s putting a great deal of faith in someone who openly admits he’s deranged because of the “toll” constant shrinking and regrowth took on him? If the screenwriters just wanted Hank out of the suit and Scott in, and didn’t want viewers considering the suit’s effects, why not just have Hank point out that he’s too old for superheroics? Michael Douglas is 70. It’s okay to admit that he’s reached a point in life where he might not be up for intense physical battles with laser-suited baddies and second-string Avengers. How does a helmet protect Scott from the Pym Particle, when his brain inside the helmet is being atomically altered along with the rest of him? That’s like saying being inside a submarine full of water will keep you from getting wet in the ocean. It’s all part of the movie’s superhero-story pseudoscience, and it’s usually best not to question comic-book science deeply (unless you can get a real scientist to write an entertaining pop essay about it, see above), but this business is particularly unnecessary, because the only thing the Pym Particle derangement and protective helmet adds to the story at all is the notion that Darren Cross is only a madman because of his exposure. Which could just as easily be explained away by the fact that he’s had long-term exposure to his own warped version of it—the “Cross Particle”—which turns people into goo instead of shrinking them. Pym Particle dementia adds nothing to the story except plot points that don’t add up. “As long as I am alive, nobody will ever get that formula.” Brave words from Hank Pym, but he’s dealing with Hydra, which is not known for being gentle with recalcitrants, or respectful of ultimatums. Why does this one work? Why don’t they just take him to one of their torture-and-reprogramming dungeons, as seen on Agents Of S.H.I.E.L.D.? How the hell did Janet or Scott disarm machinery while subatomic and shrinking into a quantum world? Both of them had to become so small, they could fit between titanium molecules to get inside the devices they were attacking—but they were still big enough to physically crash through wires and machinery, tearing and destroying them? Why don’t the shrink/grow shurikens shrink/grow things infinitely? They don’t have belt regulators, which we’re told is the only reason a person in the suit doesn’t shrink forever. For that matter, why, when Scott is subatomic and wants to grow back to regular size, does he shove one of those shurikens into his belt-regulator spot as if they’re plug-and-play devices, when they’re actually impact weapons? When Scott is in a sub-sub-subatomic space “where time and space are meaningless,” how can he still hear his daughter yelling for him as if they were in the same space? Sound waves travel, like any other transmitting medium, which requires time. This is another place where it’s best to ignore the fake science, except that the whole “love is the fifth element that trumps all the others” business is ridiculously sentimental as well as just ridiculous. Basically, the climax of the movie is the triumph of schmaltz over everything the movie’s claimed up to that point. But most significantly… Why do we have to wait until the next movie for the inevitably awesome Ant-Man/Wasp team-up? Why, when Hope is smarter than Scott, a better fighter, more practiced, more determined, and knows Pym’s former company better than he does, do audiences have to wait until halfway through the credits for the hint that she’s going to get to be a superhero too? “It’s about damn time,” she says when she sees the suit her father has made for her. And she’s damn right. We’re straight back into the depths of Trinity Syndrome on everything about Hope’s use in this film as the capable, smart, experienced lady badass who spends the whole movie training a dude to outshine and out-perform her. Yes, Hank is afraid of losing her. Yes, he’s a control freak who can’t come out and say he doesn’t want to lose her, until Scott and circumstances push him. Given that she’s so confident and forceful and that she thinks Scott’s a dimwit, and she knows what’s at stake, and she’s already been on the outs with her father before, why does she keep waiting for his permission to act? The answer here is the same answer that defines so many of these questions: “Even if it contradicts her character, we needed her to act that way to make our specific story choices proceed.” It’s the same circular answer Joss Whedon got about why he was ordered to write stupid behavior into Alien 4: “Because eet’s een the screept.” But, “This makes no sense, but we need it to happen anyway” is never a good excuse for screenwriters. Ant-Man gets away with an awful lot because it’s funny, charming, and fast, and because it has the combined goodwill of a long string of MCU successes behind it. And audiences may actually be willing to cut it a little more slack, knowing about the Frankensteinian process and tight deadlines that created it. But all signs suggest Ant-Man could have been a better movie—a more thrilling one, a more watertight one, a less intermittently baffling or silly one—with a few more drafts and a few more answers. A goofy helmet can’t protect it from the logical gaps that are already built deep inside it.